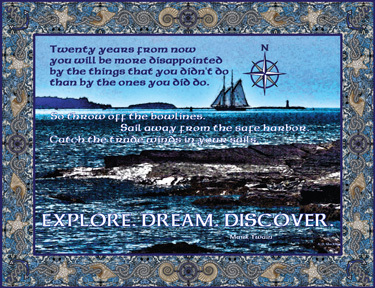 Description: Mark Twain's famous words float along the rocky shores of a seascape, reminding us to explore, dream, and discover this beautiful world. The main image is a digitally altered photograph of the Bluenose II sailing away from Halifax Harbour in Nova Scotia, Canada. I wanted the Celtic border to have a distressed wood look and so behind the seashells, starfish, and twisting old rope, you will find a photograph of blue distressed wood, a shot taken of the old bleachers on the Halifax Commons, an image that was flipped and repeated to complete the border. The text reads: Twenty years from now you will be more disappointed by the things you didn't do than by the ones you did do. So throw off the bowlines. Sail away from the safe harbor. Catch the trade winds in your sails. Explore. Dream. Discover.